Cardiovascular disease is one of the most important risk factors for mortality and morbidity in patients with Chronic Kidney Disease (CKD). This systematic review focuses on the protective effects of diuretics against the development of cardiovascular disease in patients with CKD. Among various kinds of diuretics, spironolactone, a mineralocorticoid receptor antagonist, has been shown to have protective effects against cardiovascular disease in patients with all stages of CKD, including predialysis, hemodialysis, and peritoneal dialysis. Low-dose loop diuretics have also been shown to have cardioprotective effects in patients with CKD during the pre-dialysis and hemodialysis stages; however, high-dose loop diuretics have failed to show these cardioprotective effects. The protective effects of other classes of diuretics, including thiazide and tolvaptan, against cardiovascular diseases in patients with CKD remain unclear. Keywords: Diuretics, cardiovascular disease, chronic kidney disease, spironolactone, mineralocorticoid receptor antagonist, dialysis. Keywords:Diuretics, cardiovascular disease, chronic kidney disease, spironolactone, mineralocorticoid receptor antagonist, dialysis. Abstract:Cardiovascular disease is one of the most important risk factors for mortality and morbidity in patients with Chronic Kidney Disease (CKD). 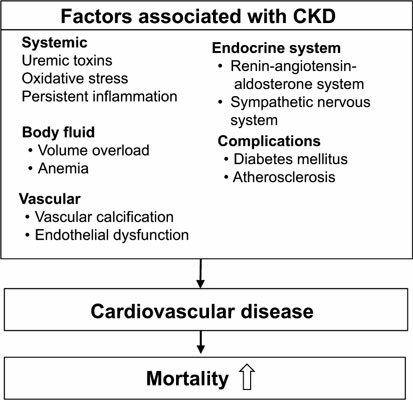 This systematic review focuses on the protective effects of diuretics against the development of cardiovascular disease in patients with CKD. Among various kinds of diuretics, spironolactone, a mineralocorticoid receptor antagonist, has been shown to have protective effects against cardiovascular disease in patients with all stages of CKD, including predialysis, hemodialysis, and peritoneal dialysis. Low-dose loop diuretics have also been shown to have cardioprotective effects in patients with CKD during the pre-dialysis and hemodialysis stages; however, high-dose loop diuretics have failed to show these cardioprotective effects. The protective effects of other classes of diuretics, including thiazide and tolvaptan, against cardiovascular diseases in patients with CKD remain unclear.